About Antiques 20050204 - Julie McClure Inc.
"These electric lights belonged to my mother and she got them from her mother. 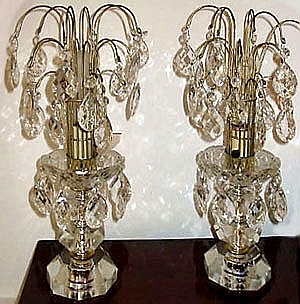 She thought they used to be for candles and were for the dining room table." You can tell these were always electric lights by the way the electric cords are wired into the lamps.Usually this type of lamp was used in the bedroom, often on a dressing table. Though lamps like these were made from the 1920s until the 1950s, your lamps look like they date from the earlier period, 1920-1930. In a shop, these would range from $95 to $150. "Could you tell us anything about this sideboard which has been in the family a long time?" 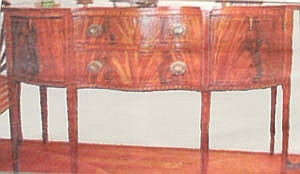 This sideboard is in the Federal style, also called Hepplewhite. Using the term "in the style" indicates that this piece was made after the date when this style fIrst became popular in this country, about 1790. You have a fine custom-made piece, dating from the fIrst quarter of the 20th century. It has wonderful cross-banded inlay, cuffed feet, and good mahogany veneers. However, the interior and back show that it was machine made rather than hand crafted. I would epect to pay about $6,000 for a similar piece in an antiques shop. My column in The [Bradenton] Herald in which readers submit photos in order to get information and appraisals "Antiques Roadshow " style, launched Feb. 4, 2006. Copyright © 2019 Julie McClure Inc.